This new Marvel series is based on the book Thrawn by Timothy Zahn. Zahn had originally brought him to life in the Thrawn Trilogy series in 1991. I would say its the first novel that truly grabbed the true feel of Star Wars. It is a great read. This new series steps back in time to see Thrawn rise to power with the Imperial ranks. Issue #2 picks up with him in the rank of lieutenant aboard the Black Crow. 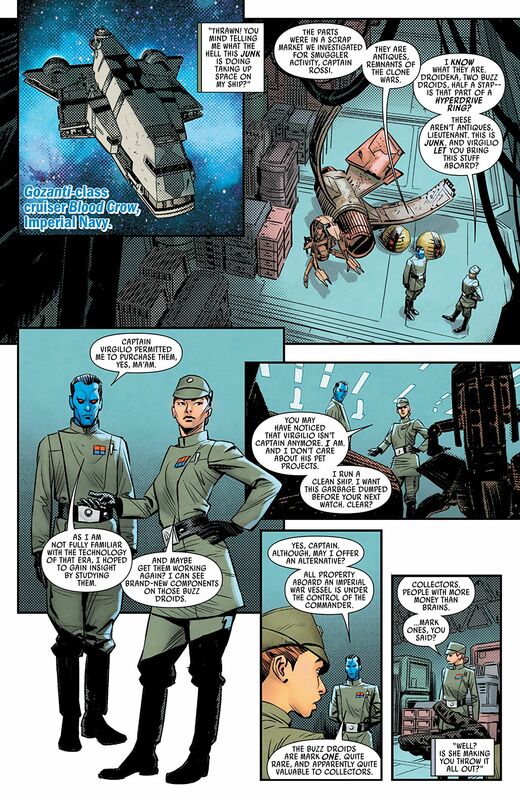 We get to see Thrawn’s clever thinking and his attention to articles of the past. The crew had recovered some Buzz Droid from the Clone Wars. It’s interesting to see Thrawn’s history unfold since his legend had to be re-written after the events of The Force Awakens. I do recommend seeing an episode of Star Wars: Rebels with the character to flesh it out more. When you read the comic with a voice in your head from the show, it makes for a much better experience. For me Luke Ross’s artwork is detailed and sketchy in parts but I’m learning to enjoy it. Hopefully the following issues will do the book justice.